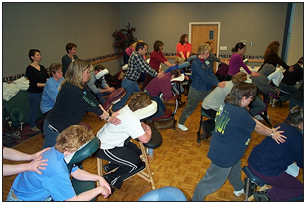 More people are giving and receiving the TouchPro Approach to chair massage than any other kind of seated massage in the world. Learning our TouchPro system saves you from reinventing the wheel by providing you with a massage that is safe, efficient, and effective. TouchPro is approved by the National Certification Board for Therapeutic Massage and Bodywork (NCBTMB) as a continuing education Approved Provider #148623-00. The completion of the TouchPro Technique seminar provides for 17 CE hours and the Marketing Seminar 8 hours.